Almería Airport has daily connections to Madrid (Iberia) and almost daily ones to Barcelona (Vueling). It also has flights to other European airports such as London–Gatwick, Rotterdam, Brussels, etc. At their website you can check all destinations and airlines. Some considerations: in Summer season there are many direct connections to several European cities, specially by low cost companies. To plan your travel we suggest to check those alternatives since could save you a significant amount of money or time. Airport is located at 9 Km from the city and about 5 minute by car from the university campus. The bus stop at the airport is the #188 (you can check the wait time). Take the Line 30 (1,05 €). Line 30 connects the city, the airport and the suburbs of Retamar (end of line). Since the bus stop is the same in both directions asks bus driver it's going back to the city. If not, you can choose either get the bus and pay again at end of line or wait till the bus take the route back from the suburbs. Get off at "Estación Intermodal", bus stop #292 (you can check the wait time). This is just outside the bus and train station. Tele-Taxi: +34686252525, phone and Whatsapp. Radio Taxi: +34667226122, phone, Whatsapp and Telegram. Málaga airport is the fourth busiest in Spain and thus has flights to most of major European airports and some non-European ones (Montreal, New York, Casablanca, Tel Aviv). Flying to Málaga could be a lot of cheaper than to Almería: we strongly recomend to check your options here and decide. You can check Málaga's airport destinations and airlines. Direct bus: there's two daily direct buses operated by ALSA, a non stop one that takes around 3h and one with two stops that takes 3.5 hours. Probably the best option from Málaga to Almería. 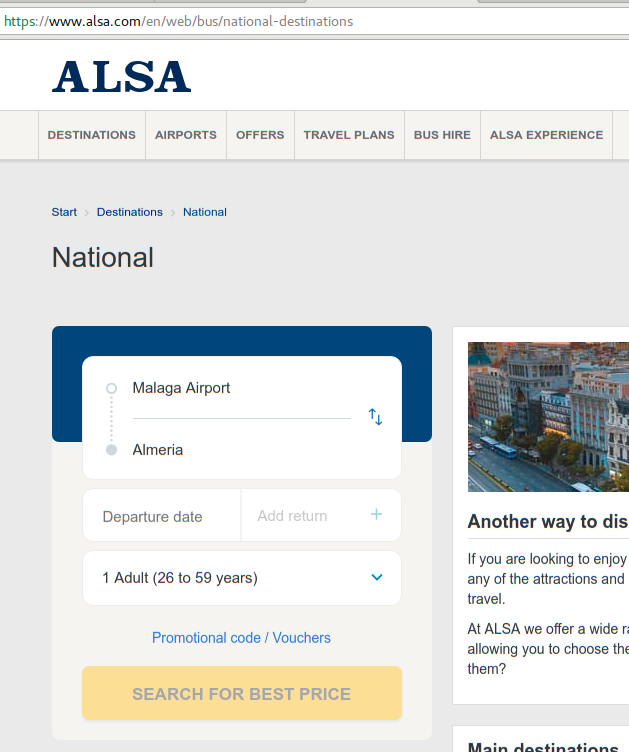 You can get a ticket by using the ALSA web page and filling in Almeria as destination. By bus through Málaga: there's a bus service available that links Málaga Airport with Málaga, and it stops both at the main bus station and train station of Málaga. There are a few others daily ALSA buses from Málaga to Almería, taking between 3 and 5 hours depending on the intermediate stops. You can buy your tickets at the ALSA website. In any case your stop in Almería is the Estación intermodal which is 10 minutes walking from Civitas residence. There is a taxi stop at the Intermodal too. Hiring a car: check the hiring car services at the Málaga airport. Car-pooling: there are several people that offer car pool rides between different points of Málaga (some including the airport) to Almería. BlaBlaCar is one of the companies that offers such a service. By taxi: this may sound crazy, but there are several companies offering transfer between the Málaga Airport and Almería (195€, 220€) so if you pool with 4 people, it is not that expensive and travel time is around 2 hours. Almería has a good land communication with all the Mediterranean coast by the A-7 highway, which join up to France frontier in La Jonquera and, on the other side, ends at Algeciras. With Spanish interior zones, Almería is connected by the A-92, another highway that connects with the rest of Andalusia and Madrid through the A-4 highway. There are some lines that connect Almería with Madrid and other cities, such as Granada, Seville, Linares and Antequera. The most important option by train is from Madrid. Keep in mind train travel Madrid-Almería takes no less than 6 hours. More information at Renfe rail transport company website. An important note: in the next months trains will stop on a station outside the city but a free shuttle will transport train travelers to the Estación intermodal. There are some ship lines that connect Almería with Africa: Melilla, Oran (Algeria) and Nador (Morocco) with daily or regular ships and affordable prices. The passangers terminal is in the seaside of the city, less than 1 km from downtown. You'll find the city of Almería covered with 4G/3G connectivity. If you have doubts about frequencies and compatibilities you can check this report (in Spanish, sorry). If you own a cell phone line adquired inside the European Economic Area then you'll enjoy free roaming. If you want to buy a pre-paid Spanish cell line there options starting from 5€. You'll be required by law to identify yourself with a legal document (passport, i.e.) when buying a cell line in Spain. Probably you'll need some electricity, we guess. You can learn about details of the electric plug system in Spain. In sort: 230 V and 50 Hz. Check the dedicated page about how to get a visa to visit Spain. The expected weather is hot. Consider hot summer clothes. Fortunately the venue and residence has conditioned air so you'll don't suffer. If you have clear skin consider seriously carry sunscreen and maybe to wear a cap. It's good idea to keep hydrated. At the conference we'll provide fresh water machines. The probability of rain those days is almost zero. You can check the weather prediction at the National Meteorological Agency.